ISLAMICA 500 is an exclusive guide of selected thought leaders, executives, professionals and entrepreneurs from around the world, active in the Islamic Economy and the Halal industry. It is the reference for Global Leaders in the Islamic Economy. 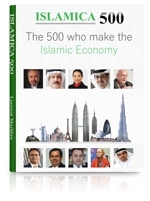 The ISLAMICA 500 is the only independent source of information to connect with the Global leaders of the Islamic economy. The third edition was officially presented on 6 December 2017 in Manama, Bahrain. is part of this guide, reflecting its contribution towards the Islamic Economy. Halal & Asie du Sud Est : opportunités jumelles!